Csaba and Bugsy are the Inn on Mill Creek’s celebrity innpugs. They are much more popular than we are, so we’re giving them their own blog entry today in celebration of their third birthday. 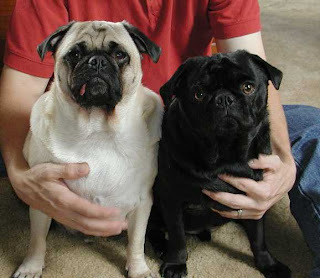 Csaba and Bugsy came from a litter of six pugs born in 2004 to Daisy Pug and Chubby Checker Pug. 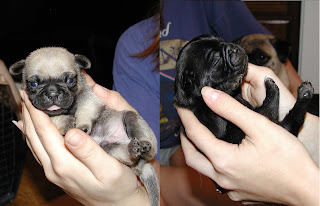 Csaba was the biggest roly poly pug of the litter and Bugsy was the only one of the four black pug puppies with no white markings. Below is a shot of the boys at three years old shortly after they woke up this morning. Happy Birthday, innpugs! 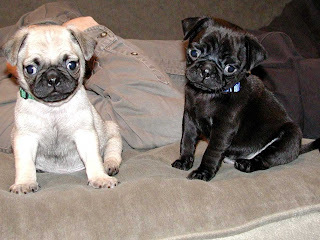 If you’d like to send them a happy birthday note, you can e-mail them at innpugs@innonmillcreek.com. They answer all their fan mail.